Embalming is essential to the burial process after someone passes. It not only preserves the body, but also helps to prevent the spread of bacteria that can harm us. It makes the body presentable for public display during funeral visitations, which helps loved ones in the grieving process. 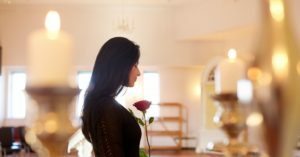 Dolan Funeral Home in Chelmsford is a family-run funeral home that serves the greater Lowell and Southern New Hampshire areas, including Chelmsford, North Chelmsford, Tyngsboro, Westford, Dunstable, Dracut, Lowell, MA, and Hudson, NH, with funeral, burial, and cremation needs. In this blog post, we’ll take a look at embalming and why it’s essential in the funeral arrangement process. Contact us today! First and foremost, embalming preserves dead bodies longer. Immediately upon death, all living organisms (including plants and animals) begin to decompose. This is a good thing so our planet is not littered with dead things everywhere we turn. Plus, this is how the earth renews itself, as decomposing organisms provide fodder for the earth and helps living organisms to go on living. A human body’s cells break down and the bacteria in a human body begins to expand, releasing gases that cause the distinctive smell of death. This pressure from the gases in the body eventually builds to the point it needs to be released. This occurs through orifices in the body. Eventually all the soft tissues in the body waste away, leaving only bones, hair, and cartilage behind. Embalming preserves against health hazards. There is a general misconception that you can catch a disease from a dead body. In general, this is not the case. Only if the person has died from an infectious disease, such as Ebola, cholera, or the plague, is this true. This is why when there is a cholera outbreak or a plague outbreak, the bodies must be buried right away. However, dead bodies can infect our water supply, due to the bacteria that forms during decomposition, but most of the time does not cause any major illness. Embalmed is done for presentation of the body, mainly for funeral visitations, or for long-term display such as with Lenin and Stalin’s bodies in Russia. In ancient times, embalming was rudimentary at best. The internal organs were removed and the blood drained. The system wasn’t perfect, but it worked, as demonstrated by the great condition of Egyptian mummies. Many early cultures had embalming or preservation techniques in place for preserving the bodies of important figures, such as leaders. Chinese rulers have been found with embalming done and in remarkable condition, but the methods were lost. Ancient cultures preserved loved ones by taking them to the mountains where the cold air preserved the bodies. Eventually, embalming became less popular, and bodies were buried as soon as possible. In the 1800s, Europeans began embalming practices again to preserve bodies for medical study. The United States began embalming in force during the Civil War, so the bodies of dead soldiers could be transported home for burial services. The replacement of body fluids (the blood) with a preservative solution that can be based on formaldehyde or not. The most common embalming method is arterial embalming where these special fluids are injected via the carotid artery in the heart. A special machine is used to remove the blood. Cavity embalming involves the removal of internal fluids inside the body cavity. A small incision is made just above the navel. The fluids are removed and replaced with another preservative that is usually formaldehyde based. Hypodermic embalming may be performed on individuals where arterial fluid had not reached during the first stage of embalming. This is directly injecting embalming fluid into the skin and tissue. Surface embalming is mainly employed during death from accidents or when severe decomposition has already taken place. Again, preservatives are injected directly into these superficial areas to help with appearance of the body. The entire time it takes to embalm a body varies, but in general is between two and four hours. In the case of autopsy or trauma to the body, this time can be stretched significantly. Setting the features is unique to mortuary work, where the eyes and mouth are posed, hopefully to resemble the person with the help of a recent photograph. Embalmers are licensed by their states to ensure proper training has been attained in the care and preservation of human remains. It’s important to understand that embalming does not stop the decomposition process; it merely delays it, so family has time to mourn. Death is a natural process that human intervention cannot stop. The simple answer is no. In fact, due to the blatant misrepresentation of this by funeral directors, a federal law was passed, stating that funeral homes cannot say it’s the law to embalm loved ones. In fact, funeral directors must say the exact opposite: that embalming is not required. Some states have different laws; however, in general, embalming is not required in the case of immediate burial, direct cremation, and a closed casket funeral if the body had been refrigerated. Christianity allows embalming. Jews, however, do not embalm or cremate their loved ones as burial is supposed to be done within 24 hours of death. Muslims do not practice embalming either and encourage burial as soon as possible. Most funeral homes, including Dolan Funeral Home in Chelmsford, honor the family’s wishes. We offer both cremation and embalming services, as well as visitation for those who choose not to embalm or cremate. We offer caskets and urns in many styles for you to choose from. In our aftercare services, we offer help with the legal aspects of death as well as the actual burial itself. We have antique hearses and modern hearses since we are required by Massachusetts law to use a hearse to transport the body of your loved one both to the funeral home and from the funeral home. We have limousines available as well. Dolan Funeral Home takes the best care of your loved one after death and of you during the grieving process. We understand the emotions of death of those left behind; that’s why our mission is to make your funeral planning process as easy as possible, so you can focus on your family. We’re there for you. Contact us today!